It is well known that the DM10 can not produce a velocity on a traditional switch type triggering zone. 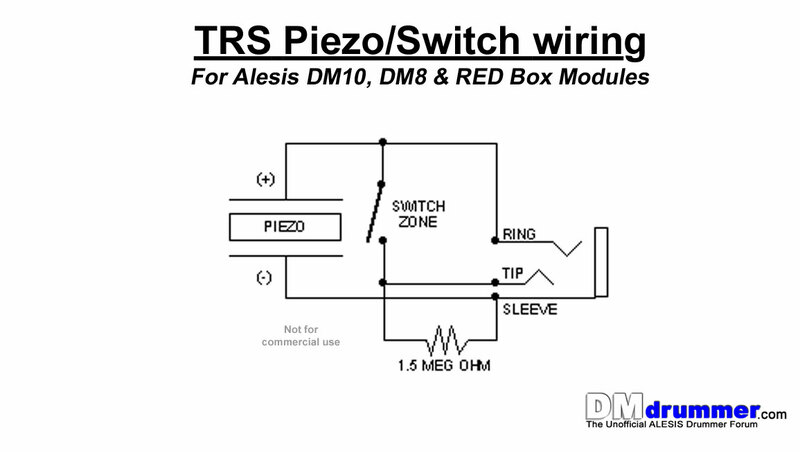 To get a switch zone on the DM10 to have a velocity, the DM10 must be tricked to think the switch zone is a piezo zone. This is done by using just one piezo for both zones and inserting a switch between the piezo and the default zone. When Retrigger and Zonetalk are set properly on a given input, the “default” zone is always triggered first when signal is seen on both head and rim at the same time. The default zone should be the head zone. • When both “tip” (head) & “ring” (rim) receive signal at the same time, the module defaults to “tip” (head) when retrigger and zonetalk are set correctly (anything other than zero). You may need to play with the settings some. • By using a normally open switch on the “tip” (head) zone, the “ring” can be default. The switch zone is hit closing the switch just as velocity is being sensed by the DM10 causing the “tip” (head) zone to see the piezo and thus triggering the sound assigned in the DM10 for that zone. When not hitting the switch the “ring” (rim) zone is default. The DM10 can not handle a floating piezo input. Because of this a resistor must be added to keep the “tip” zone from floating. Failure to add the resistor will result in random tip zone triggering. The resistor should be at least 1.5 mega ohms for the configuration to work properly. It may be possible to set this configuration to handle a dual zone plus choke by utilizing the “mute group” function of the DM10. This will depend heavily on the switch design. If the switch closes to easily, then it may choke when it is not intended. On the other hand, if it is too hard to close the switch, you will not get very good velocity sensing from that zone. The trick is to find that happy compromise in the switch design. The other draw back would be, poly would need to be turned off in order to function as a dual zone plus choke. That type of set-up would not sound that pleasing to the ear when it come to cymbal swells. I have completed my testing and can state that it works 100% with the Alesis Trigger I/O as well. I have an opportunity to buy a new dm10 studio kit for 600 its just missing the hi hat. So to be clear…the sleeve has the brass of the piezo and one end of the resistor, the tip has the other end of the resistor and one of the switch, and the ring has the other end of the switch and the ceramic lead from the piezo? The pic at the top of the article shows the piezo, switch, resistor and TRS plug in a non schematic way to make it as clear as I can. Awesome! I appreciate the help…I tried wiring it up last night and kept getting hung up with where to wire the switch to. Im setting up a ride cymbal to create an edge/bow sound. On my drum kit are Pearl TruTrac Heads and the module is a 2Box Drumit Five. But the 2Box does not support the rims of the TruTrac Heads. What should I adjust to get it working? MVG. : Wilbern (The Netherlands). Unfortunately, I don’t own a 2Box Drumit Five module, so I’m not sure what you would need to do to get the rims working. You might want to try asking over at http://www.2box-forum.com. They might be able to help. Alesis (ion) & Rock Band 2 Together! 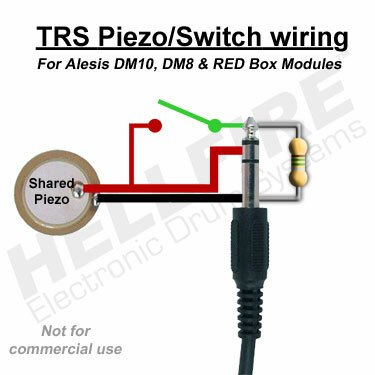 Alesis DM10, 57 Trigger Zones Total!